The EB-5 Program is an affordable way for wealthy foreign nationals to obtain a Green Card and US Permanent Residence status through a monetary investment in a project that creates at least 10 jobs in the US. Do I need to create new jobs for the EB-5 Program if I invest in an existing business? Can I purchase a new development condo and qualify for the EB-5 Program? 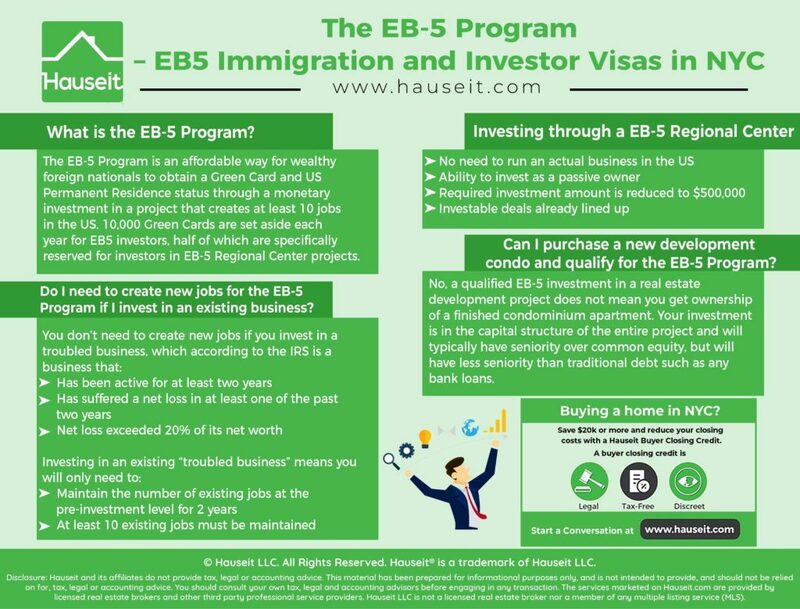 This Immigrant Investor Program is commonly known as the EB-5 Investor Program and was created by the US Congress to stimulate the US economy through job creation and capital investment by foreign investors. Currently, the US Citizenship and Immigration Services (USCIS) administers the EB-5 program which was originally enacted in 1992 and has been regularly re-authorized by Congress since. 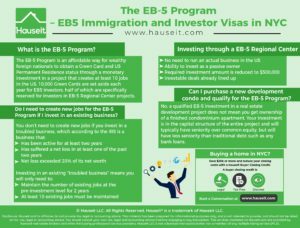 10,000 Green Cards are set aside each year for EB5 investors, half of which are specifically reserved for investors in EB-5 Regional Center projects. The minimum qualifying investment for the EB5 program is $1 million. This threshold lowers to $500,000 if the investment is in a Targeted Employment Area, which is either an area with high unemployment or a rural area of the United States. A Targeted Employment Area is an area that at the time of investment is either a rural area or an area that has an unemployment rate that is 150% of the national average. According to the Government Accountability Office’s August 12, 2015 report, approximately 90% of all EB-5 investments are made in Targeted Employment Areas. A rural area is any area that is outside of a metropolitan statistical area, as designated by the Office of Management and Budget, or outside the boundary of any city or town that has a population of at least 20,000 people according to the latest census. You will need to provide evidence that your new commercial enterprise will create at least 10 full-time jobs for US persons with full work authorization. For practical purposes, this means you need to be able to hire at least 10 US citizens or permanent residents as full time employees. These 10 employees cannot include yourself or any members of your immediate family such as your spouse or your children, nor can it include any temporary workers or anyone who is not fully authorized to work in the US. You will need to submit a comprehensive business plan which will explain why your commercial enterprise will need to hire at least 10 full time employees within the next two years. You should include a timeline with approximate dates on when each employee will be hired. Yes. You will still need to create 10 new jobs unless you are investing in a “troubled business” as defined by the USCIS. A “troubled business” according to the USCIS is a business which has been active for at least two years but has suffered a net loss in at least one of the past two years which exceeds 20% of its net worth. If the existing business you are investing in meets the USCIS criteria of a “troubled business,” you will only need to submit evidence that the number of existing jobs at the pre-investment level is being or will be maintained for at 2 years. Additionally, at least 10 existing jobs must be maintained. You should submit tax filings, Forms I-9 (Employment Eligibility Verification) or other relevant documentation for the qualifying employees in addition to a comprehensive business plan in support of your petition. But doesn't the USCIS require EB5 Program investments to be made only in new businesses? – Expanded through the investment so that a 40% increase in the net worth of the business or a 40% increase in the number of employees occurs. Many EB-5 green card investors do not actually want to run a business in the US, nor do they have the time to actually engage in a commercial enterprise in the US. Furthermore, many EB-5 investors may find it attractive that the required investment amount is reduced to $500,000 when investing through a designated EB5 Regional Center. Therefore, it may make more sense to invest through an EB-5 Regional Center which already has investable deals lined up. There are many Regional Centers located throughout the US, ranging from small private offices to large public/private partnerships. EB-5 Regional Centers cover a wide range of industries, and some EB-5 Regional Centers have a particular focus such as real estate development. Day 1: Deposit $500,000 into escrow and submit the I-526 Application. 3-6 months: I-526 Application is approved and the funds are released to the project. If your I-526 Application is denied, the $500,000 in escrow will be returned to you. Once the I-526 Application is approved, you and your family will receive Temporary Green Cards. 2 years: You can file for an I-829 within two years, and if approved you and your family will receive Permanent Green Cards. 5 years: After you have had your Temporary Green Cards for at least five years, you and your family are eligible for the naturalization process to become US citizens. If it were only so easy! Unfortunately, a qualified EB-5 investment in a real estate development project does not mean you get ownership of a finished condominium apartment. Your investment is in the capital structure of the entire project and will typically have seniority over common equity, but will have less seniority than traditional debt such as any bank loans. Please note that you should expect to receive at least your principal investment back unless the project fails. The amount of interest or economic returns you will receive on your investment will vary depending on the project, and may be negotiable. However, even though your investment would traditionally be classified as either preferred equity or mezzanine debt, you will typically see far lower returns than traditional investments in this category. If you plan on residing in the US and moving to NYC as soon as you receive your Temporary Green Card, then you’ll need to find an apartment to buy or rent as soon as your I-526 Application is approved. 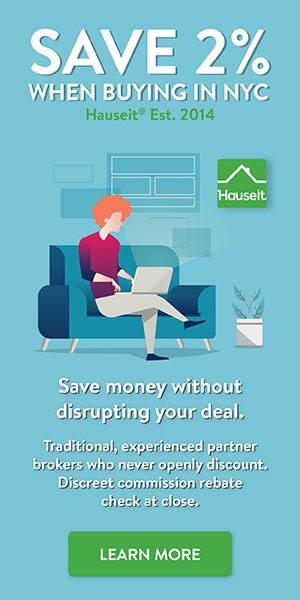 Since you’ll be unfamiliar with New York City, you should enlist the free help of a veteran buyer’s broker to guide you through the process and find you the perfect apartment that fits your lifestyle. The EB-5 Program has come under legislative scrutiny due to concerns that urban developers are taking advantage of Targeted Employment Area (TEA) rules to reduce the investment amount necessary for EB5 investors in cities with high real estate values. As a result, some developers have been receiving a customized TEA in cities that appear to have low unemployment such as NYC, but after nearby census tracts with higher unemployment are included, have an unemployment rate that is greater than 150% of the national average. – An $80 million loan from the New York City Regional Center to a joint venture affiliated with The Witkoff Group and The Ian Schrager Company to develop a mixed-use building on Manhattan’s Lower East Side. – Between $200 and $250 million of EB-5 investments for the planned $4.9 billion Pacific Park project in Brooklyn, formerly known as Atlantic Yards. – A large portion of the financing for Extell’s International Gem Tower which is on West 47th Street in Manhattan. Proposed changes in EB-5 legislation include the Leahy-Grassley bill which aims to do away with the above mentioned practice and require a single census tract to be used to identify a targeted employment area. This would be a major blow to NYC based real estate developers and the projects they hope to build in wealthy neighborhoods such as TribeCa, SoHo and West Chelsea by The Highline Park. The Leahy-Grassley bill would also raise the minimum investment amount to $800,000 to adjust for inflation for projects in Targeted Employment Areas. Note: Two other bills have also been offered in the US House of Representatives from Zoe Lofgren of California and Jared Polis of Colorado which would preserve the status quo and allow contiguous tracts to be combined, as the states themselves see fit. None of these bills have moved through committee as of this writing, but experts think that the Leahy-Grassley measure is more likely to get traction.